I’ve been off grains and legumes for quite some time now. Nearly a year, give or take a few encounters. But never a regular visitor in my diet. When we were in Haiti a few weeks, we enjoyed lots of rice and beans. On our way home, we feasted on only the best airport food our terminals allowed – PIZZA, BEGALS, and Texan BBQ. I don’t think I ever remember being that bloated. It was intense. Now I am not 100% against grains and legumes, but for myself, and my body, they just don’t mess too well. I know the case over spring break was quite and overload of that stuff, but even in small doses my body seems sluggish and blah! I have been reading a lot on the paleo lifestyle, and am relating to much of it. Now, I am not promoting that everyone switch to a paleo eating plan, nor do I think I will do that entirely. But I do promote that each of us listen to our own body. To learn what we best function on. I am so thankful to the Habits of Health program I was coached through and now coach others through, that helped me learn to listen to my body. So with all that being said, I was exploring different recipes to try. 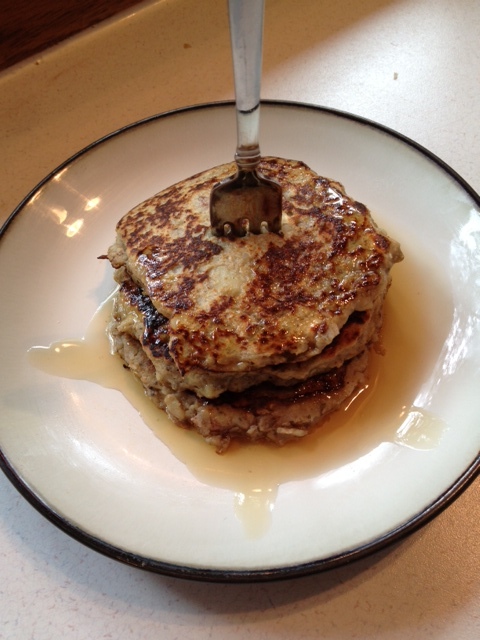 I’ve been curious about “Paleo Pancakes,” and thought I’d give it a try. I scooped up some great REAL Maple Syrup from Whole Foods. and I am off! Peal the sweet potato and cut into small pieces. In a pot of boiling water, boil potatoes until soft. Remove from pot and mash with a fork. In a large bowl, whisk eggs, pumpkin pie spice, baking powder and salt. Add in potatoes and whisk until a smooth consistancy. Heat oil in a frying pan over medium heat. When hot, add 1/3 cup of batter. Cook for 2-3 minutes each side. It helps to fry one pancake at a time. And add an additional 1/2 tsp of coconut oil with each cake. Serve with 100% REAL Maple Syrup, or top with fruit of choice, or even apple sauce! Posted in Vegetarian. Bookmark the permalink.